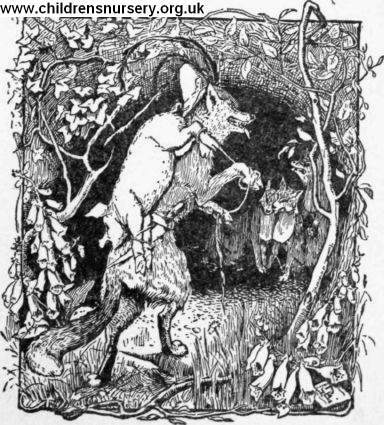 rolled full tilt; and when the fox came up, all that he saw was a large black kettle spinning over the ground at a great pace. Very much disappointed he was just going to turn away, when he saw the kettle stop close to the little brick house, and in a moment later Blacky jumped out of it and escaped with the kettle into the house, when he barred and bolted the door and put the shutter up over the window. "Oho!" exclaimed the fox to himself, "you think you will escape me that way, do you? We shall soon see about that, my friend," and very quietly and stealthily he prowled round the house looking for some way to climb on to the roof.